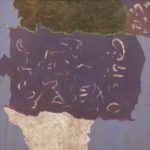 For the American Abstract Expressionist Theodoros Stamos, paint was alive, possessed of a power that could connect the artist directly to nature. The son of Greek immigrant parents, Theodoros Stamos was born in 1922 on the Lower East Side of Manhattan. When he was eight years old he suffered an accident and during a three-month convalescence began to draw and make sculpture—a pastime driven by a talent that earned him a scholarship to the American Artists School, in Greenwich Village, when he was just 14 years old. A part-time student, he concentrated on sculpture rather than painting. At no point in his career did Stamos receive any formal training as a painter, which is remarkable considering his prominent place among the artists who came to be known as Abstract Expressionists. In 1935, Mark Rothko and Adolph Gottlieb joined with eight other modernist painters in New York to form the Ten. One of the group’s members, Joseph Solomon, taught at the American Artists School. Intuiting Stamos’ true vocation, Solomon encouraged him to paint rather than sculpt. Taking his teacher’s advice, the young student abandoned sculpture and took up painting with such fervor that he dropped out of high school, even though he was just three months from graduation. Supporting himself with odd jobs, Stamos painted, visited the handful of New York galleries that exhibited contemporary art, and, in 1941, found a permanent position as the manager of a frame shop on West 18th Street. There he met Fernand Léger, among other members of the Parisian avant-garde exiled to New York by the German invasion of Paris. Betty Parsons, the director of the Wakefield Gallery and Bookstore, gave Stamos his first solo exhibition, in 1943; and when Parson opened her own gallery a few seasons later, he continued to show with her—an association that gave him an introduction to Barnett Newman and Gottlieb. Hardly out of his teens, Stamos was finding his way into the New York avant-garde—and feeling himself swept along on the same aesthetic currents that were bearing Gottlieb, Newman, Jackson Pollock, William Baziotes, and others to their first mature work. These painters were becoming, in a word, Surrealists. More specifically, each was finding his own version of the biomorphic Surrealism that had emerged in Paris nearly two decades earlier. Originating in the Surrealist method of automatic drawing, biomorphism not only pictures living, germinating form. It posits painting as a kind of germination, a process that draws on unconscious energies to give birth to new and, of course, organic shapes—hence the sprouting, twining, flowering presences one sees in the work of the biomorphic Surrealists. Except for Arshile Gorky, no American practitioners of this style were recognized by André Breton, Surrealism’s “pope” in exile. And it is arguable that the Americans owed as much to such New World predecessors as Arthur Dove and Georgia O’Keeffe as they owed to their European contemporaries. Nonetheless, Stamos’ Sounds in the Rock (1946) would have been at home in an exhibition devoted to Parisian Surrealism. The rock in this painting is as mushroom- or bird-like as it is rock-like, a seemingly animate thing, which suggests that the sounds it contains—or makes—are at least potentially intelligible. Stamos invites us to see the forms in his paintings as fellow beings, presences with which it is possible to empathize. In notes for a 1953 lecture, Stamos addressed a large question—“what, how, and why nature in art?” And that, he adds, is “just the beginning of my queries.” “What,” he asked further, “is the secret of silence?” With this unanswerable question Stamos seems to be saying that, in its muteness, a painting preserves mysteries. 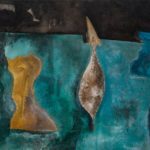 But its meanings are never completely ungraspable, as he suggests by asking, “What is the spirit which guides and expresses the physical world?” For this question leads us back to his biomorphic paintings and invites us to feel at one with the inner lives of their unknown but peculiarly familiar shapes. As we respond to the distinct qualities of these highly evolved, fully individuated forms, they come awake to us, animated by a spirit we could attribute to our imaginations, to that of the artist, or to the organic energies of the natural world. At this stage in his career, Stamos was an heir to Romantics’ faith that art immerses us not merely in nature but in the creative flow of Nature with a capital “N.” As the 1940s continued, his imagery merged the contours of leaves and branches with those of birds in flight. Reaching across the surface of a painting, spidery lines acquire amphibian traits. Clouds solidify into geographical features and warm-blooded anatomies are born of the stony shapes that proliferate in his paintings from this period. 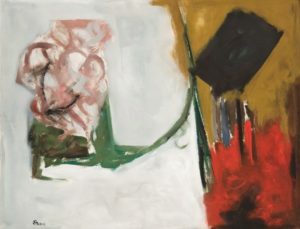 In an essay published in the catalogue of Stamos’s 1946 exhibition at the Betty Parsons Gallery, Barnett Newman wrote that the younger artist’s “ideographs capture the moment of totemic affinity with the rock and the mushroom, the crayfish and the seaweed,” adding that “one might say that instead of going into the rock, he comes out of it”—an image of the artist not as an inhabitant of the natural world but, rather, as its progeny. Noting his colleague’s powers of “communion” with non-human things, Newman suggests that Stamos himself is a natural phenomenon, which is even more remarkable considering his childhood in the streets of Manhattan. In 1948, Life magazine ran an extensive article on avant-garde art, illustrating it with reproductions of paintings by Stamos, Willem de Kooning, Gottlieb, Pollock, and Baziotes. Three years later, Life published a group portrait of these artists and 10 others, Newman and Clyfford Still among them. Dubbed “The Irascibles” after protesting the Metropolitan Museum’s exclusion of their work from a recent survey exhibition, they were soon gathered under single label—“Abstract Expressionism”—despite their differences. Newman was a geometer, Pollock a paint-slinger, and de Kooning a painterly painter with roots not only in the Parisian avant-garde but in the Baroque of Peter Paul Rubens. Moreover, they all were evolving rapidly. 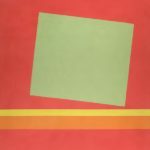 Early in the 1950s, Stamos ushered subtly geometric forms into his paintings—echoes, perhaps, of the monuments, cathedrals, and other sights seen on his recent travels in Europe and United States. Yet his hints of architraves and lintels still have an organic feel, for he did not abandon the biomorphism of his early work so much as enlarge his vision of Nature to include civilization. And we see the artist’s vision of civilization expanding as he inflects the surface of the canvas with the calligraphic marks of his Tea House series, a reflection of his long-standing interest in Asian art. For years, Stamos had studied Chinese and Japanese paintings in the collections of the Metropolitan Museum of Art. 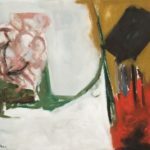 Now he was finding his way to synthesis of Eastern and Western traditions, a development with parallels in the austerely gestural paintings of fellow Abstract Expressionists Franz Kline and Robert Motherwell. As they narrowed their palettes to black and white, Stamos had turned by the end of the 1950s to high-keyed yellows and reds. As even his blues and grays grew luminous, his aesthetic evolution had taken him once again to new territory. Stamos again focused on paint—not merely as a medium but as a theme—in his contribution to a 1959 issue of It Is, one of the Abstract Expressionist circle’s short-lived little magazines. “So,” he wrote, “it is the eye and the paint—the paint on canvas—with which I am involved, allowing the paint to have a chance and achieving a harmony between the two.” This harmony of vision and image, of seeing and the thing seen, could be construed as a formalist goal of the kind that implies an ideal of pure art. Thus, we could see in Stamos’s paintings of the 1960s—with their expanses of near-monochrome pigment and spare deployment of geometric shapes—an affinity with color-field canvases by Jules Olitski, Helen Frankenthaler, and other painters championed by the formalist critic Clement Greenberg. Yet this reading ignores the symbolic charge that energized Stamos’s imagery throughout his career. 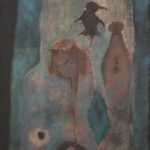 His paintings of the 1940s are obviously responses to natural things, less pictures of rocks and mushrooms and birds than evocations of the artist’s empathetic embrace of these and many other subjects. Alert to the artist’s capacity for merging with—one might say, feeling in concert with—his surroundings, we feel his presence, the texture of his awareness, even in the light that fills the Infinity Fields that first appeared in the 1970s. Continuing until his death in 1997 to refine and intensify his relationship with Nature, Stamos arrived at a seeming paradox: form that uses its monumental grandeur to give an enveloping intimacy to subtleties of color, light, and evanescent form. Always innovative, he nonetheless left nothing behind, and thus it is no surprise to see in late Infinity Fields animated, sometimes almost agitated streaks of color that would be entirely at home in his earliest mature paintings.